Everyone loves the flavor of grilled food. It’s one of the best parts of the summer months when everyone is out barbecuing. The flavor of charcoal definitely adds a unique depth to the food that preparing in the oven or on the stove top does not contribute. If you grill your food with the best coal and you use lighter fluid to start the flame, I have the perfect alternative for you. Use a charcoal chimney instead of lighter fluid. Using a charcoal chimney will spare you the risk of having the food taste like lighter fluid. It also can save you the money of the cost of buying lighter fluid. Here is how you can use a charcoal chimney. Read on for more information. Take the grate off the grill. Use the 2 pieces of old newspaper to fill the last space on the charcoal chimney. The newspaper pieces need to be securely tucked in the lower part of and the charcoal chimney should be positioned on the bottom of the grill right in the middle. Place some of your favorite brand on charcoal on the top part of the charcoal chimney. Fill the chimney all the way to the brim with charcoal. This will last you through several steaks, burgers and other grill food favorites. Use the matches or lighter to ignite the newspaper on the lower part of the charcoal chimney. 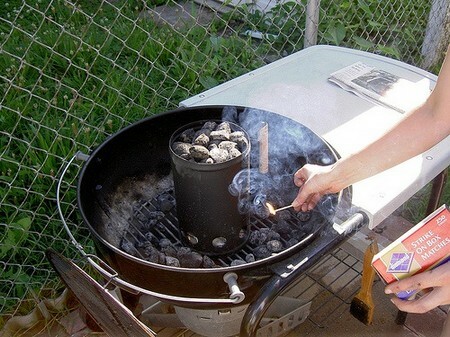 Do this by inserting the matches or lighter into the holes on the sides of the charcoal grill. You will notice the newspaper burning right away. You will see and smell smoke instantly. Allow the charcoal to warm for approximately 30 minutes. You will notice the appearance of the charcoals change when they are heated. They turn an ashen grey. You’ll notice that the middle of the coals are very hot and orange in color. This next part requires extreme caution and protection. You will need heat resistant gloves for this part. Grasp the charcoal chimney by the two sides and turn in upside down in one fast motion. You are emptying the hot charcoal into the grill. Place the coals in a pile. Make sure you do not burn yourself or dump the hot charcoal out of the grill. Utilize the bottom surface of the charcoal chimney to even the burning coals out. Spread them evenly. Put the grate back on the grill. Add your food in the normal way and proceed to grilling.